Ha ha. 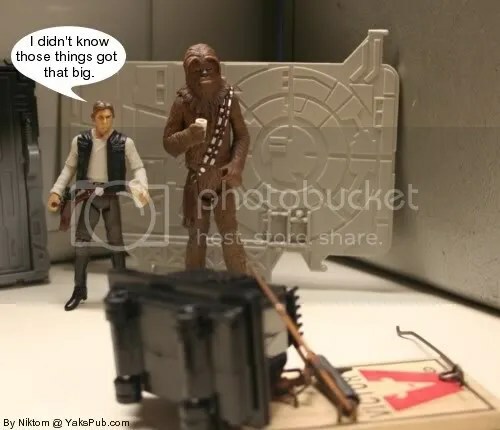 That’s a pretty big mouse droid. Great couple of skits lately, Nik’. Thanks! Yea, I think it’s more of a “Rat Droid” due to the size. Yeah. Where did you get that? It’s from the ill fated 12 inch Hasbro line. I think that one actually came with the Death Star Droid. However, it was packed with the Han/Luke Stormtrooper 2 pack first. It may have been included in another one but I really don’t remember. Ah. I should have known this.